If your looking for a commentary on human cruelty and terror, stop looking right now. 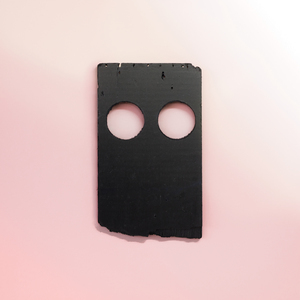 Low’s 12th album Double Negative is just what you need. Duluth’s finest have always been about dark, slow indie rock and often romantic. Well, in the 25 years the trio is active they go all in on that, setting aside the romanticism. Indeed, Double Negative is Low’s most heavy, gloomy and dark work to date. Although electronics and drum machines have been present since Drums And Guns (2007), now the use of pulses of static and noise are seemingly fully realised. Especially the bass on several tracks is absolutely punishing. Low welcomes us with loops of static on ‘Quorum’. Husband and wife Alan Sparhawk and Mimi Parker voices drift around demanding our attention. Without a breath to spare a heartbeat drum plunges us into ´Dancing And Blood´ which sets the tone of the rest of the album. Quickening in fear, the song advances from an oppressive atmosphere to a razor sharp statement with the phantom-like voice of Parker in its centre. Alan Sparhawk and Mimi Parker never shunned to address social issues. Now they focus themselves on the social and political wrong sides of the world and especially in America. Double Negative’s music could be seen as a mutated impressionistic state of today’s society which, to him, is passively dealing with technological overload. Sparhawk paints a grim picture of our inability make sense of it al in Donald Trump’s era of “fake news”. On tracks such as ‘Tempest’ and ‘Poor Sucker’ Low tries to reflect these odd times. Sparhawk seems angry and beaten. On ‘Dancing and Fire’, Sparhawk lamently sings, “It’s not the end, it’s just the end of hope”. And yet there are some sparks of hope to be found on Double Negative. Parker’s divine “I believe, I believe …” on ‘Always Up’ is like a sunbeam that breaks through dark skies. Sparhawk’s approach to redemption from the onslaught of daily life is more down to earth. On the blunt stomper ‘Rome (Always in the Dark)’ he seemingly wants to take action “Let’s turn this thing up before they take us out”. Double Negative is intended to unfold humanity, logic and modern society, thus becoming a disorienting story that places Low’s deepest fears on a scorched landscape. ‘The Son, the Sun’ is rendering of that. The distant synth echoes and reverberating wordless singing will only give you shivers. The 11-song statement shares common ground with The Flaming Lips’s The Terror and Kid A/Amnesiac from Radiohead. Yet this work seems like another leap forward. The fraying core feels like a radical shift from Low’s previous work. The songs all seem to be composed, broken apart and are roughly assembled again. Double Negative closes with ‘Disarray’, a ballad which heavily leans on electronica. To me this is the most heartfelt song that the band has written since Drums And Guns‘ ‘Murderer’ in 2007. “Before it falls into total disarray, you’ll have to learn to live a different way.” Low doesn’t offer any solution but instead leaves us with something to think about. As distant this might be, it also a wake up call that challenges us to rethink our ways for the better. This entry was posted in WRM and tagged 2018, Alan Sparhawk, album review, ambient, cd, Donald Trump, Double Negative, Drums and Guns, Duluth, Indie rock, Low, Mimi Parker, noise, Radiohead, Slowcore, static, Sub Pop, The Flaming Lips, The Terror. Bookmark the permalink.